The PADI Underwater Navigator Specialty course will help you become a pro at finding your way underwater. When you're underwater, knowing where you are and where you're going comes in handy. When looking for that beautiful reef that you've heard all about or locating your favorite Lake Superior Shipwreck, proper navigation is important. PADI Underwater Navigator manual included and yours to keep. Includes: PADI Underwater Navigator manual and certification processing. Scuba equipment is not included, but may be rented (advanced reservations recommended). 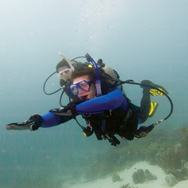 Read the PADI Underwater Navigator manual and complete the knowledge reviews. You also need to complete a PADI Student Record File (which includes a Medical Statement). If you answer yes to any of the medical history questions, we must require a signed physicians approval before you participate. You can download and review the PADI Medical Statement here. Please print a copy to take to your physician for their approval and signature if required.